This page presents a modified version of the Bresenham's algorithm, which prints ALL the points (not only one point per axis) the ideal line contains. This line is called supercover line (according to Eric Andres) and this algorithm might be a particular case of DDA (Discrete Differential Analyzer) algorithm (according to Srikanth). It may be useful for example when you have to know if an obstacle exists between two points (in which case the points do not see each other). 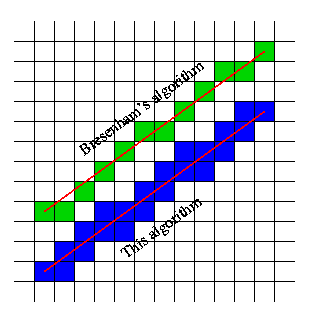 Figure below shows the difference between the Bresenham's algorithm (which draws a classical line) and this one (which draws a supercover line). I suppose you already know the Bresenham's algorithm. If not, see the links above. To simplify the discussion, suppose we are in the first octant. Suppose the point is in square A. The next point (using Bresenham's algorithm) will be B or C, like in our algorithm. However, while Bresenham's checks B and C, our algorithm has to check the points B, C, and D.
If the Bresenham's algorithm does not change the y-coordinate (next point is C), this means that D will not be drawn, so we pass directly to C, and we go to the beginning again. 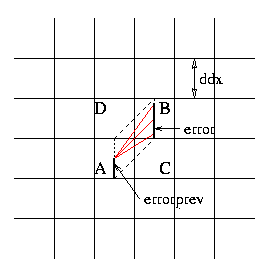 error is the current error (in point B), while errorprev is the previous error (in point A). Remember that the error is the "distance" (non-normalized) from the ideal point to the grid line below the ideal point. // printed, not only one per x coordinate. Here we have supposed that if the line passes through a corner, the both squares are drawn. If you want to remove this, you can simply remove the else part dealing with the corner. Note: The line is symmetric, i.e. a line from x0,y0 to x1,y1 is the same as a line from x1,y1 to x0,y0.